Salzburg stalemate: What next for Brexit? A tasty schnitzel may be the only thing that satisfied Theresa May in Salzburg. She's left an EU informal summit having been told to give ground on trade and the Irish border by November. The bloc says it's ready for a no-deal scenario, if not. May said her "Chequers" proposals for trade with the EU were the only way forward. But French President Emmanuel Macron countered: "The proposals in their current state are not acceptable, especially the economic element. The Chequers plan cannot be 'take it or leave it'." May promises new proposals to reassure Dublin that it would not get a "hard border" with Northern Ireland but warned she could live with a no-deal outcome. 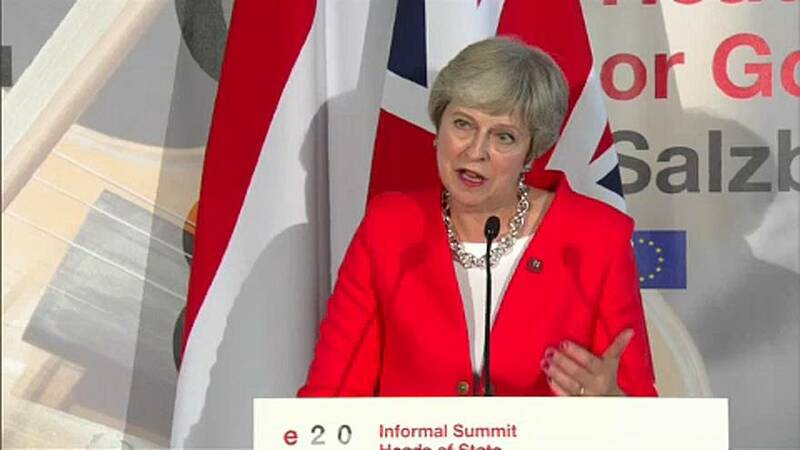 "There is no counter proposal on the table at the moment that actually deals, delivers on what we need to do and respects the integrity of the United Kingdom and respects the result of the referendum, that's what we've put forward," she said. The EU Commission president was jovial as he sought to reassure over a possible no-deal Brexit. Jean-Claude Juncker commented: "A no deal is not my working assumption. But would it happen, than we are prepared. Because the Commission prepared in detail all the elements of consequences of a no deal which could be entailed by a no deal. So don't worry, be happy, don't worry. " Migration was also on the menu - with Austria pushing for boats to be stopped at source. "In an ideal case, it could happen, as in the case of Egypt, that the boats will not be launched in the first place. Its an objective that we are coming closer to now than a year ago. Three years ago these ideas were condemned as radically right-wing, but now more and more countries support it," said Austrian Chancellor Sebastian Kurz. Migration continues to divide the bloc, with members at odds over ways to tackle it. And all this amid those challenges surrounding Brexit.